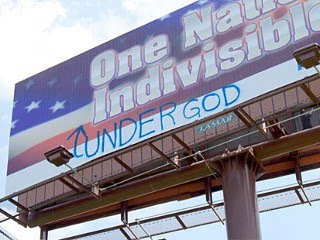 Billboard Battle in Bible Belt: One Nation 'Under God' or Not? Deep in the heart of the Bible Belt, a dispute over God and country is being waged very publicly. It all started when an atheist group decided to remind people of the history of the Pledge of Allegiance by putting up six billboards around the state of North Carolina, in honor of the July Fourth holiday. One was placed even on Billy Graham Parkway in Charlotte. The signs read "One nation indivisible," a reference to the Pledge of Allegiance but deliberately omitting the words "under God." The billboards, paid for by the North Carolina Secular Association, a coalition of groups including the Western North Carolina Atheists, were intended to show that even Americans who don't believe in God can be patriotic and to promote a sense of unity. The group points out that the words "under God" were not in the original pledge, which was written in 1892. Congress added them to the pledge in 1954 -- as America was locked in the Cold War with communist and atheist Russia. Jennifer Lovejoy, a spokeswoman for the secular association, said including the words "under God" was discriminatory. "I don't believe in God and I don't believe that our country was founded on Christianity or any religion," she said. "I'm not taking away anyone's belief in God. Many of our forefathers feared God, but I think they feared religion more -- and what it could do to the country if any one religion was allowed to be in control." "Any religious reference excludes people and we're a government of the people, for the people and by the people," said Asheville City Councilmember Cecil Bothwell. Bothwell, a self-described "post-theist," was not involved in the campaign but supports the billboards. In Asheville, N.C., where one of the billboards stands, the Rev. Ralph Sexton, pastor of Trinity Baptist Church, is fighting back -- with his own billboards and help from the church coalition We Still Pray. "We felt we couldn't just look the other way," Sexton said. "It was important enough to stop and say that needs to be answered." Sexton and We Still Pray, a group founded to support prayer in public schools, immediately responded with four digital billboards that bore the message: "One nation, under God." "The biggest thing that bothered me as a person of faith was I thought, at best, it was disingenuous. ... Our very Constitution, our law system, everything is built upon the word of God," Sexton said. Sexton disagreed with the assertion that having those words on U.S. currency and in the Pledge of Allegiance made atheists feel left out. "It's political correctness gone amok. Silliness," he said. Sexton's digital messages will remain for a month. "We are a people of faith. We are a nation that is built on Christian principles and we need to make sure our children, our grandchildren, our teenagers, our young adults, know what we're really all about," he said. The atheist group said it may put up more billboards in the future. ExChristian.Net: Billboard Battle in Bible Belt: One Nation 'Under God' or Not?